Disclosure: An Advance Reading Copy of this book was provided to me by Bell Bridge Books via NetGalley. This rating, review, and all included thoughts and comments are my own. It's Labor Day weekend and St. Simons Island, Georgia, is flooded with holiday tourists, even though a category one hurricane is churning in the Atlantic just east of the Florida peninsula. It's a minimal hurricane, after all, and not expected to show any real attitude before it makes landfall in South Carolina. Plus, everyone knows that hurricanes don't hit the coast of Georgia. The concave shape protects it from the vagaries of the world's most devastating storm. Everyone forgot one very tiny but important detail: Mother Nature tends to scoff at absolutes...and she'll makes us pay dearly for the hubris of them. Janet is intensifying fast, a unique sequence of weather conditions falling into place and turning a relatively weak hurricane into the single most devastating and powerful force on the planet, a Cat 5 monster that will scour the earth of everything in its path. 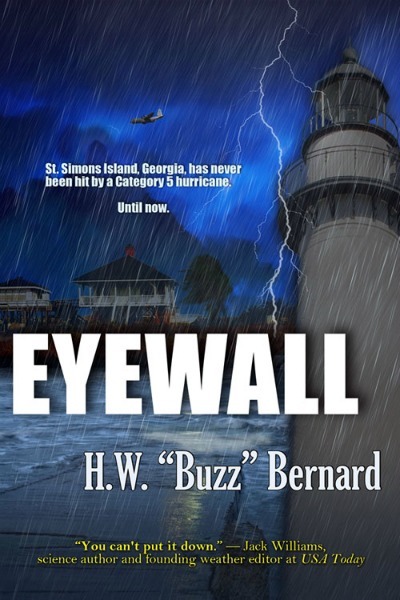 As it turns its voracious eye towards the Georgia coastline, Janet badly damages then catches a Hurricane Hunter plane, capturing it and its crew within her calm center after some bad intel had them flying in at far too low an altitude for their plane to survive intact. On the island in her path is a family vacationing from Atlanta, a family with a daughter who skipped out and a father who is belligerent in his ignorance of Hurricane Janet's deadly plans. As the first bands of Janet start to slam into the island, concern for his daughter's safety mounts until he and his wife are beside themselves. By the time they realize that the original forecasts on Janet had been terribly, horribly wrong it's too late to evacuate and their fifteen-year-old daughter is trapped behind the walls of a gated and closed house on the next island. Winds too strong for breath, a storm surge that will eclipse the island's highest point, and no escape from either. Hurricane Janet is coming. And Death is riding her coattails. My hat is off to H.W. "Buzz" Bernard, who crafted an intelligent and informative, gripping and emotional thriller that kept me on the absolute edge of my seat. I couldn't put Eyewall down. I couldn't look away. I was captivated within the first few pages and had to ride it out to see how it all ended up. That, to me, is what a thriller is supposed to do, and this one did it. I suppose I could be a little critical of the formulaic plot, and anyone who's ever seen a natural disaster movie or read a natural disaster book has met the stock characters that it contains. There's the guy who knows better than his own family that there's no danger, disregards the warnings, and through his arrogance and ignorance, puts them all in danger. There's the willful teen who rebels against her family at the worst possible time and makes it all infinitely worse. There's the dogged hero, worn out by life for whatever reason but who steps up to the plate when needed. There's the experienced professional, the one voice of knowledge against a cacophany, who is invariably punished for knowing more and speaking up but is lauded alongside the hero in the end. And there are usually women who love them both because of it. You've seen all or most of these characters many times before, and the formula won't surprise you if you're as much a fan of this sort of thriller as I am. In that regard, I suppose it's not all that different from any of them. But I am a fan of natural disaster stories for the very reason that I like that formula and enjoy those characters, and this one had my heart racing as the tension mounted throughout. And for several personal reasons I'll mention in a moment, this particular story really worked for me. Bernard took a bad situation to its extremes, kept the tension high with a taut, driven narrative that shifted focus seamlessly, and while moving around his character archetypes, managed to make them relatable, believable, and likable (except, of course, for those you're not supposed to like). I rooted for them, hoped for them, yearned for their safety. I wanted to shake them when they were foolish, kick them when they were stupid. I was totally into the intensity, caught up in the risk and the looming threat, dry-mouthed at the realized danger. I was affected throughout the whole book. It was plausible (more than some may believe), it was gut-clenching, and it was written with intelligence and obvious knowledge. For all that and more, the book just flat-out thrilled me on just about every level. The date was August 13th, 2004. It was a Friday, which, really...so very apropos. I was sitting at my computer, happy to have the day off from work, as officials had closed my place of employment when the area fell within the cone of uncertainty for the track of Hurricane Charley, a small category two hurricane coming up into the Gulf of Mexico from Cuba. We were really a statistical outlier as far as the expected track was concerned, it was slated to make landfall in Tampa, about two hours north of my home in Fort Myers, later that afternoon. I wasn't concerned. I did, though, have the TV on, tuned to the local weather because Charley was getting closer and, honestly, hurricanes fascinate me. We'd been warned to expect some wind, some rain. We'd been told it wouldn't be significantly worse than a summer squall as far as intensity goes, and it's Florida in the summer...we're sort of used to that. No. Big. Deal. I was playing a card game online, sipping a soda, and chatting via instant messenger with friends who were more concerned than I was about what was slated to brush by us. I had no shutters or boards on my windows or doors, hadn't bothered taking in my porch furniture, had no cooler, no ice, no food stocked, no batteries handy, no portable radio set up, nothing. Hey, Charley was heading for Tampa, and it was too small to cause us any real strife, and it was just a category two. I'll never forget the moment I realized how incredibly stupid, how horrifyingly ignorant I, despite my fascination with hurricanes, had been. I heard it in the voices of the meteorologists during the joint broadcast I had playing on TV...what had been little more than background noise as I played and chatted. It was something I'd never heard before, so it caught my attention. It made me turn my head towards the picture on the screen, and what I'd heard became what I could also see, and neither the game nor the chatting seemed as important after that. By the way, if you've never heard fear in the voices of trained and experienced meteorologists, be glad. I don't recommend the experience. It didn't start with fear, though. It started with an odd and tight caution - that's what caught my attention. The National Hurricane Center had Charley steady on his forecasted path, but our radar, the same local radar I watched daily, was suggesting something else. The meteorologists were obviously hesitant to argue with the NHC but motivated to warn their viewers. A slight jog to the east...closer towards the coast...seemed to be more of a steady turn, and it could be clearly seen that Charley had tightened up, intensified. It was starting to bear down on the southern tip of Sanibel island as if it intended to jaunt along Summerlin Road on its way to the heart of Fort Myers. My home abuts Summerlin Road. I spent hours wedged into my microscopic laundry room, couch pillows piled up under and around me, my two dogs stuffed into the adjoining downstairs bathroom. Bathroom door closed tight. I'd unearthed my portable radio - though the reception was horrible - and huddled in the dark, alone but for the dogs, listening to the weather reports over the wail of wind. I was so damned afraid. Fortunately (for me, anyway - a lot of others weren't so lucky and my sympathies were with them), Charley seemed to change his mind again before he hit Sanibel, jogging a bit further north to devastate Captiva and Port Charlotte. Fortunately Charley was small, with the most intense winds less than twenty miles out from the eye. Fortunately, the sustained winds where I live were not totally devastating and though damage was wide-spread, the gusts didn't topple anything over onto my condo or my car. Fortunately, fortunately, fortunately. Maybe that's why Eyewall hit me so hard, worked so well as a tightly woven thriller. I'm not a meteorologist, so I have no idea if the events of this book could happen to the coast of Georgia. I know beyond a doubt, though, that it could happen. That to a lesser degree it has happened. I was there. Oh, and one more thing... When Hurricane Wilma made landfall several miles south of us in October 2005, my windows were boarded, radio and candles handy, batteries ready, and both my hurricane kit and my cooler were stocked.